My five-year-old is wide awake and smiling at 8 am. “No! I have no idea,” I feign. He is ecstatic, but as people are very proper around these parts, I remind him we need to wait until exactly 4 pm. That’s the scheduled time to go! He isn’t talking about taking a trip to Giza, of course. 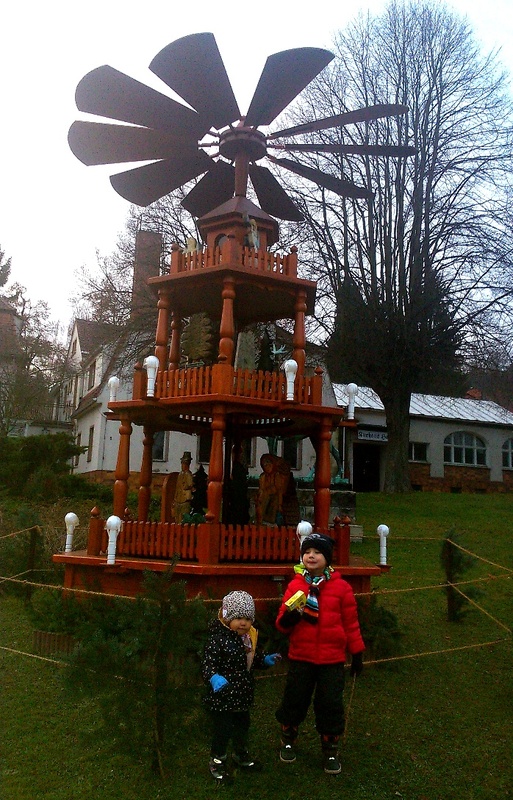 The Christmas Pyramids are part the Erzgebirge (Ore Mountains) traditions here in Saxony. The picture above is a traditional “Pyramid”. They sit in almost every home window at Christmas. In our town, people don’t go crazy with Christmas decor. A string of lights here, a Pyramid there. 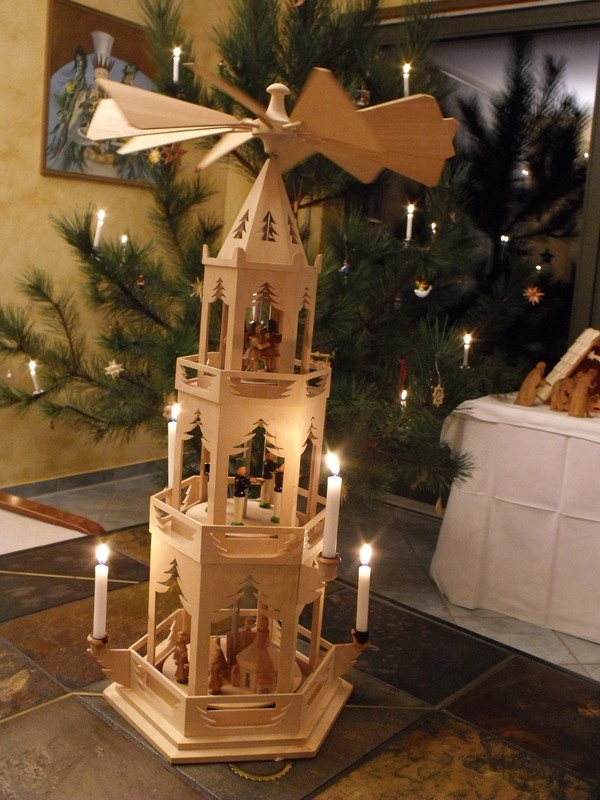 The intricate wooden pyramids are carved and handcrafted by local artisans. Several layers depict Christmas scenes: angels, forest animals, or nativity figurines. The real magic happens when the base candles are lit. Heat from their flames spins the pyramid’s tiers around, and the figures seem to dance. 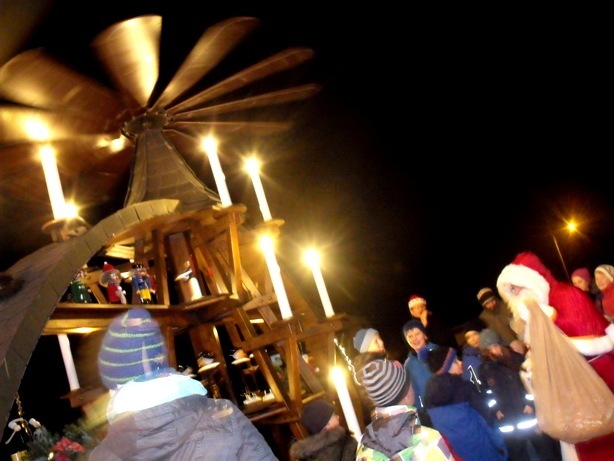 When winter dark wraps these snowy villages, the Erzgebirge Pyramid stands, tall and bright. Its candle light glows with warmth. Pyramids can be miniature in size, or as huge as a house. 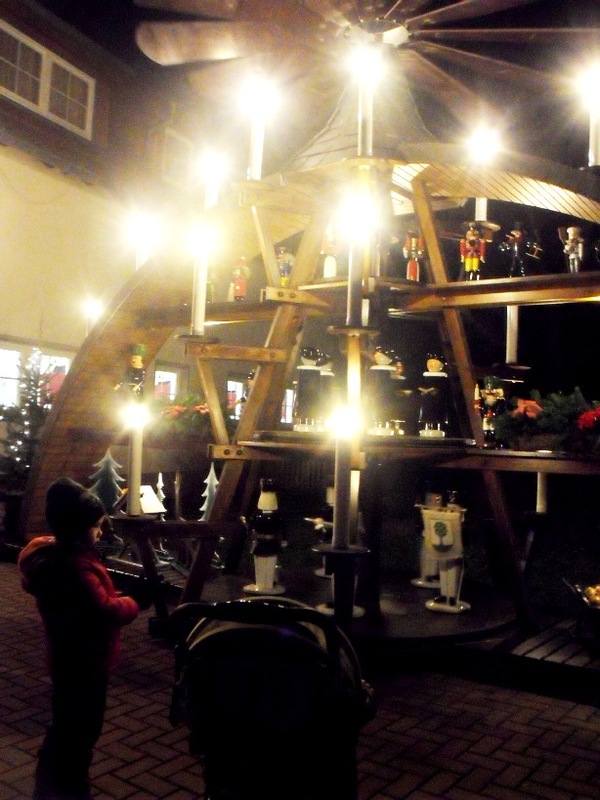 In traditional Christmas markets in Sachsen (Saxony), they’re the most popular purchase. 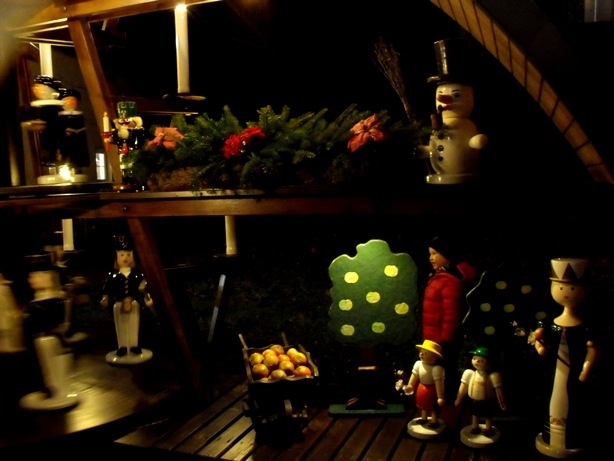 Also in true Erzgebirge tradition, some folks place a wooden Schwiboogen in home windows. Like the one pictured above, from Waldland Blog. It’s said that, when working during winter, local miners would hang their lanterns at the cave entrance, to find their way back out of dark caverns. In turn, villagers hung lanterns in their windows, so that fathers, brothers and all the hard-working men would have light to guide them home. The grandparents’ house doesn’t have a single Christmas decoration yet. Only proper wooden Christmas ornaments, like the pyramid. “And the Weihnachtsbaum only on Christmas Eve! Not a day earlier,” Oma reminds us. “With real candles lit,” adds Opa. It takes us a good half hour to wrap up for our walk. I’m a new mom, and not used to preparing all these layers! At 4 pm, the streets are already dark. Only a few street lamps, plus the Christmas arches in the windows. We pass other pedestrians headed in the same direction. The kids are too excited to complain about the cold. 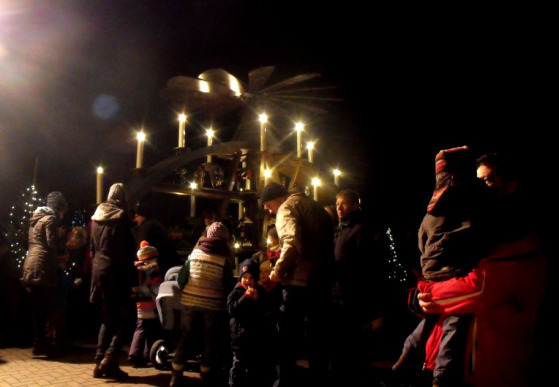 After all, the Weihnachtsmann (Father Christmas) is coming to light the town’s giant Pyramid! 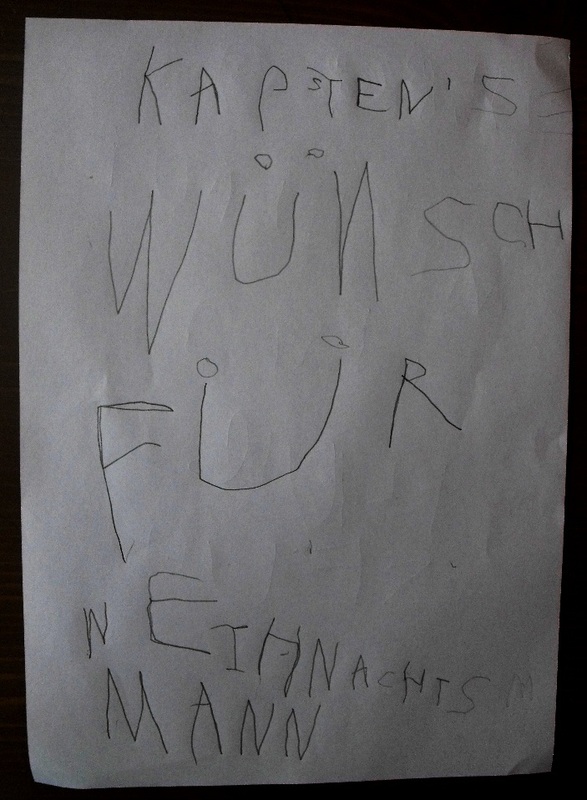 My son has brought his wunschzettel, or wish-list. He’s also tried to be a very good boy lately. 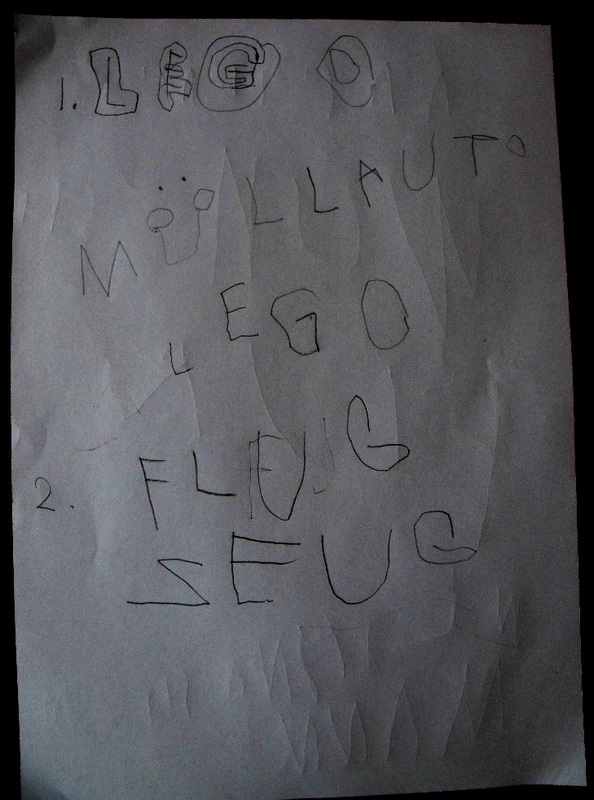 It was the first time he had tried to write so many words on his own! We follow the lights. One kilometer later, the delicious scent of Glühwein and grilled Bratwurst lead us to the Pyramid. The lighting celebration is held at the fire station. 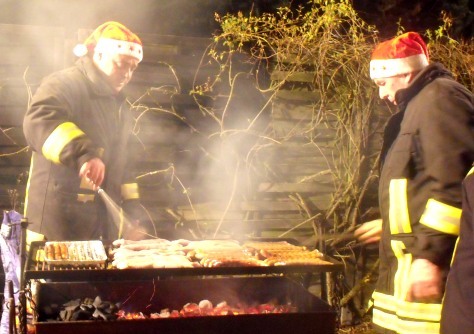 Children are bundled up from head to toe, and the “Apple Queen”, with her crown of flowers and apples, greets us: “Frohliche Weihnachten!” Festive fireman serve the food and drinks. Opa orders three Thüringer Bratwursts, my favorite German sausages; we sip piping hot Glühwein, as you always must in winter. My son disappears in the pile of kids; he must give his wish-list! 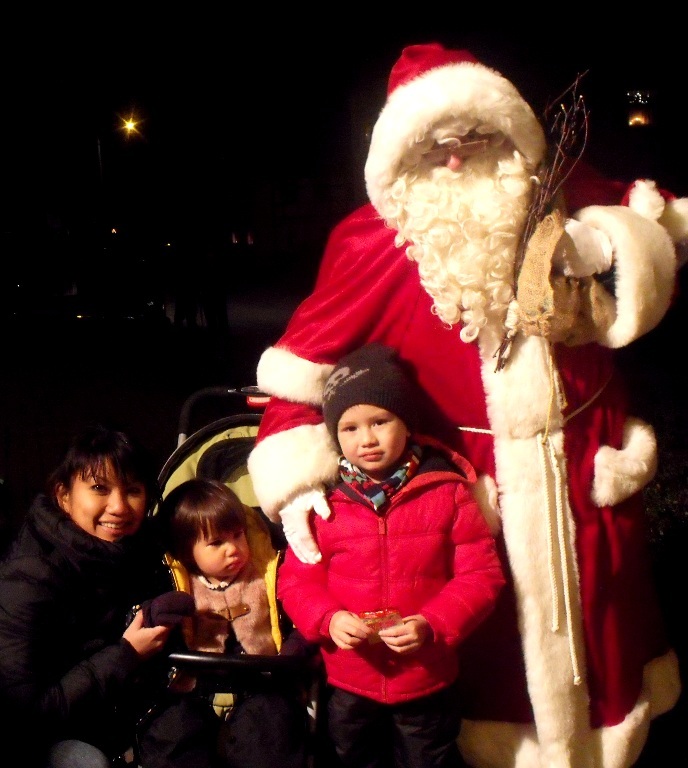 When the crowd later disperses back towards the food stalls for more eating and drinking, we are the few brave ones to request a photo with Father Christmas. 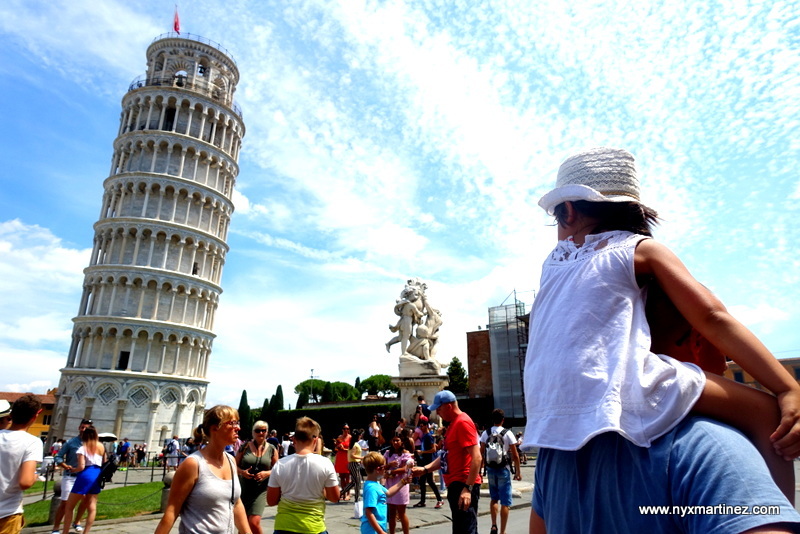 People don’t take pictures here like they do in Asia…but they do take pictures of us taking pictures! As we head back home later, Opa tells us more stories from his boyhood, and how it was when they celebrated in December. Suddenly, we hear the jingling of bells and the clopping of hoofs. 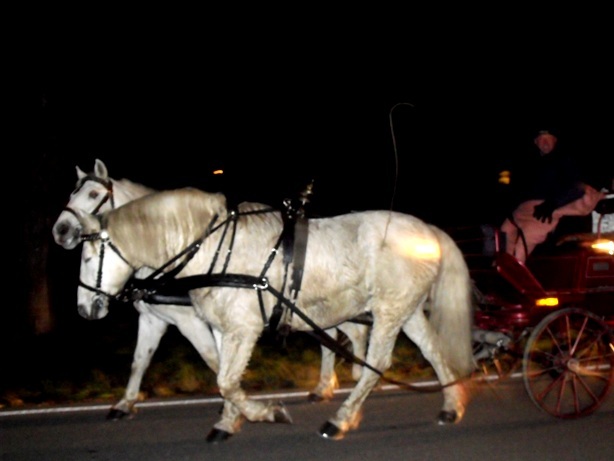 A horse-drawn carriage passes us by on the road, its driver waving merrily. “It’s cold!” my son says, skipping to keep warm. 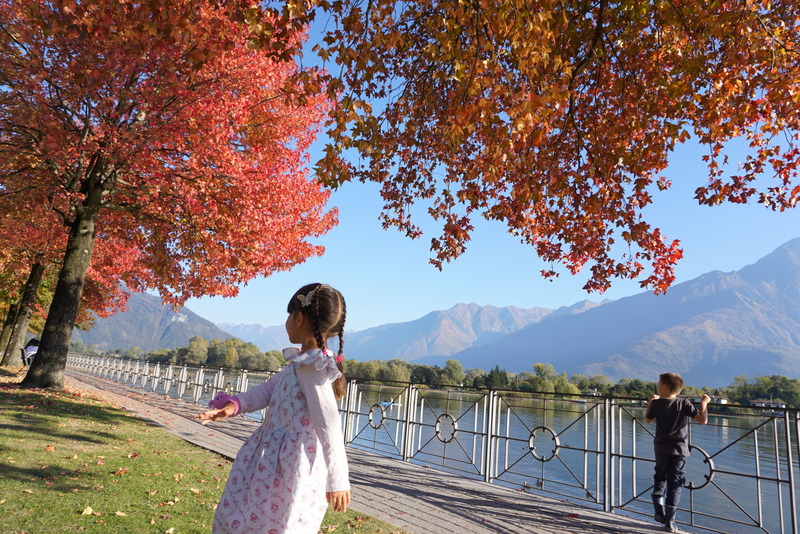 We finally reach the little footpath leading to our home. Son asks where our Christmas star and decorations are. “Special!” my daughter has just learned to talk. She’s been repeating this new word since yesterday. “But now, it’s time for you kids to get a good night’s sleep, and for us adults to drink a hot grog,” Opa concludes, as we reach our front door. “What a good idea!” I reply. We’ve spent Christmas both in Asia and in Europe, plus I’ve enjoyed a few in Africa. Now, with children of my own, my favorite season has new traditions, meaning, and magic. And yes, everything is more special at Christmas. Especially in Saxony! 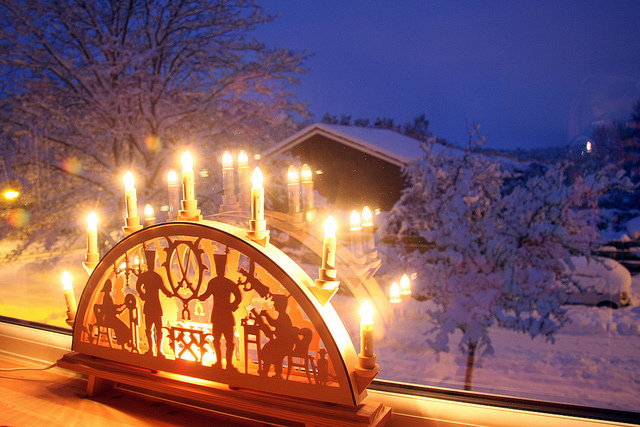 Next post A Proper Saxon Christmas: Nutcrackers & Magic!